We’re feeling proud here at Tuscarora this week. 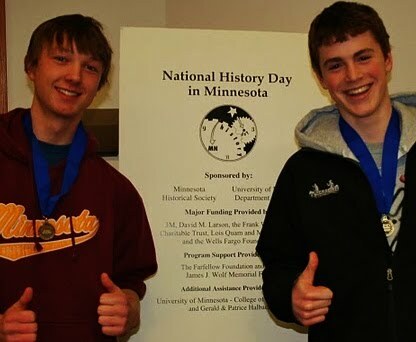 Daniel will travel down to Minneapolis to present a History Day Project at the State Competition on Sunday. He and his friend Alex progressed from the Regional Competition last month (with the video at the bottom of the page, and with the help of some community members). Hooray for Daniel and Alex! Shelby was inducted into the National Honor Society on Monday night. Hooray for the 10th graders! Andy and I have almost made it to spring, with a score of 193 according to the DNR “winter severity index”. The highest reading, 193, was at Poplar Lake along the Gunflint Trail. That was the only station that fell into the “severe winter” category, although Snowbank Lake near Ely was close at 177. Here are some other final readings: Grand Rapids, 98; International Falls, 150; Isabella, 159; Eveleth, 150; Cloquet, 112; Brimson, 149; Tower, 164. So, technically, we won state up here!! Andy was still smiling this morning as he brushed off the car, with his score of 193. Hooray for the severe winter survivors! Next post Now That’s More Like It. "I love Canada Canada Canada"